Prince Edward Island is located in the Gulf of St. Lawrence, off the Atlantic Coast of the Canadian mainland. Prince Edward Island or PEI is one of the four Atlantic Provinces. The Micmac made PEI their home and called this beautiful Island Epekwitk, meaning resting on the waves. The Mi'kmaq of the Atlantic Region which included the Gaspe Peninsula and parts of Maine were organized into seven political districts. Prince Edward Island was one of these districts. These districts made up the Mi'kmaq Nation under the leadership of the Mi'kmaq Grand Council. The first permanent French settlement began at Port La Joie in 1720 with further settlement at the fishing port of St. Peters. 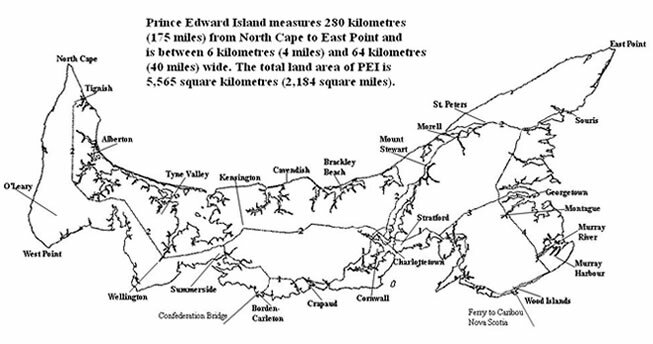 During 1740's and 1750's, the population along the north shore between Savage Harbour and Malpeque was very small. Settlement consisted of one farm deep along the shoreline. The 1750's and 60's brought much turmoil to the PEI population as Bay of Fundy Acadians sought refuge were expelled and then Louisberg fell to the British in 1758 and PEI became British. The British surveyed the Island, divided the land into 67 townships, distributed them to influential petitioners and allowed local administration in 1769. During the first half of the 19th century, many Islanders managed to acquire title to their lands. At Confederation about 50 percent of the lots in PEI were in freehold tenure. The 1875 Act gave the Island government the power to force landlords to sell their holdings. Land ownership was made possible for the former tenants by lease purchase agreements. The first organized British census was taken in 1798 and the total population of PEI 4,372. Steady net immigration continued for almost 100 years and in 1891 the population reached a high of 109,000 however declined in the 1930's to a low of 40,000. According to Statistics Canada, the population of PEI in 1999 was 138,000. 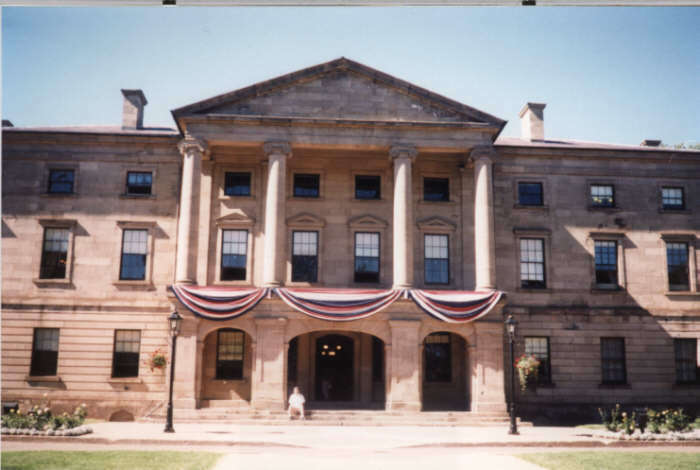 Today PEI has two cities, Charlottetown (capital city) located in Queens County and Summerside located in Prince County. There are 7 towns: Alberton, Cornwall, Georgetown, Kensington, Montague, Souris and Stratford. The Confederation Bridge between PEI and New Brunswick opened in 1997 and provides a direct land access between New Brunswick and Prince Edward Island. The major PEI industries are: agriculture, tourism, fishing and manufacturing. The first lobster season runs from May 1st to the end of June on the north side of PEI and the second season runs from mid-August to mid-October on the south side of PEI. Green Gables House is one of PEI's most popular attractions. L.M. MONTGOMERY, is author of Anne of Green Gables. Montgomery was born on the north shore of Prince Edward Island and raised in Cavendish. Anne of Green Gables has been translated into 15 different languages and put on film. The story created an image of the Island that draws 350,000 visitors annually from around the world to Green Gables House. Charlottetown is home to the University of Prince Edward Island. The University consists of seven major Faculties each with several programs for undergraduate and graduate students.